When I bought the car it was dead, no wiring, no electrical connections on the engine at all. Sure there was an alternator on there and I still have it. I don’t know if its original or not, I seriously can’t imagine it is, it looked like it was on its last legs anyway. So as I was getting a new rewire kit from American Autowire (link here), and it would need a one wire alternator, I decided that as I am replacing it I might as well get a chrome one. I have visions of my car with lots of chrome on it. I also wanted an update from the 48amp in order for me to run halogen lights that I want in her, and have plenty of power in reserve. I started looking around and found a supplier eventually who told me the chrome version was only a few pound (£) more. Result, I ordered it. Was it worth the extra money? The box had on the outside “our chrome will get you home”. Brilliant, it will look good, and get me home safely. People will say what’s the point? Simple – I know it’s there and that is a good enough reason, end of! Opening the box, the alternator was inside nicely wrapped in plastic and lots of cardboard to hold it in place. Simple leaflet that basically say put positive wire here, and to top all of that – a nice sticker of the logo. Awsome, that’s goin’ in the man cave. The alternator was highly polished, finger prints showed up on it and I was well chuffed with it. The fact that it was going to make my fitting easier, look good and do the job, all bonuses as far as I was concerned. I obviously bought the Ford fitting version and compared to the old one the holes were all in the right places. It was a little bit bigger but nothing to worry about. This version has the internal voltage regulator as well so I could bypass a potential weakness on my old classic. Note where the location of the terminal stud is on the back. I picked a nice day, after I had got the wiring all through the engine bay to where I wanted it all to go to. There is a bracket that allows a the alternator movement to tighten against a belt, a long bolt, spacer and that is about it. I put the alternator to the main pivot point at the top, added the spacer and put the long bolt through to the block, and tightened to almost finger tight. Next was the bracket at the bottom, this is mounted via a bolt near the crank pulleys. The bracket has a kink in it to allow the alternator belt not to rub the bracket. Due to the location of the bolt there is a step on the bracket to move it back in line with top fitting. This is a standard bracket (at this point of fitting). Bolt applied and was located on the bracket at about 2/3rds to 3/4s of the bracket movement. On inspection and trying to sort out why it would not travel the distance caused me concern. I could hear a dull thud when I let the alternator try to fall to vertical from the pivot bolt. Looking at the back I found the very big issue. The stud bolt for the main positive battery charge was hitting the side of the engine block. No worries I will move it up. Bearing in mind that I would need a belt and room to adjust it, this was going to be a big ask. I pulled the alternator to its max on the bracket, the clearance due to the angle of the bracket only gave me about 1/8 inch 2 to 4 mm at the most clearance from the engine block. Considering the amps and vibration involved this was not be far enough away from the block for my liking. Also, the fact I would have no adjustment on a belt now what so ever as it was at the limit of the bracket too. This is now bad scenario. I had to pay a lot of money for this alternator as they are not that common, so I couldn’t just return it. a) modification to the bracket. I took the choice to make a mod, the money is a premium right now and nobody is really going to notice the part I have in mind. I had a bracket made for me by my mate and senior mechanic consultant (I bet he like that bit), his name – Will, from his own business at Park Garage. I have got the review and spec of the part we came up with in a little section below this review. They are dependant on each other so I put them together here, if that makes sense? This was interesting as it was not ever going to be a standard Mustang belt. The new bracket allowed me much more adjustment and the rear stud is now a good 3/4″ away from the block. No chance of an earth out or spark jumping from the alternator to the block, that could cause a total failure or even a fire while driving along. Tip: as I had no idea of the size belt, I used an old piece of rope to wrap around the crank and alternator v-pulley. Mark the join and stick the two ends together. You now have a guide size to compare the belts too. I bought a couple of variations on the size, to save extra trips if it didn’t fit. My first choice did fit and I took the other two back for a refund. The belt I got to fit? A much more common Saab 95 belt. Cost? very low and the alternator is now a 1/3 of the way up the adjustment, plenty if I needed more. (After the custom bracket fitting of course). It works and it outputs the charge to the battery. There isn’t too much to say about it other than that. The front face plate reverse has the cooling splines that work well and should not overheat when the current draw gets heavy. It’s also a very quiet running unit. Long term road test is not available just yet as I can’t drive the car legally at the moment. I expect that due to the overall build quality, it will last mechanically no problem. It works we have established that. Appearance: RUBBISH (for the use of a polite word). After one year the chrome has pitted and even come off. Now, I know it was outside and in the cold. BUT, it was under a custom fitted Storm Proof cover, and in a sheltered space. There is no excuse for this to happen. It just shows that the chrome was so thin I may as well be sprayed on. I’m not happy about it at all. Check the pictures of the pitting. The picture is larger than I normally upload so you can see in detail the damage. I have marked the pitted areas in red. Difficult, this has me torn a little, one side of me says low marks and the other side says it works. So based on the facts that I had to have a bracket made at the time of fitting, the stud is in the wrong place (because I didn’t know there was a clocking process at the time and is not stated on instructions). After one winter the chrome is coming off, vs, it works. It won’t be high as a main reason for me buying this style it for it to look good as well as functionality, but now it has a potential to look rubbish and ruin the effect I was after. I now know that under the hood I have a rubbish looking alternator, that just does its job well. Was it worth the money? I don’t think so, their chrome won’t get you home as it will flake off before you get there. But having said that, the workings of the alternator will. Don’t by the chrome version unless you can look after the chrome and keep it protected from pitting and flaking. The alternator has performed well since fitting and the chrome flaking has not gotten any worse. I feel that I can now revise my score on the functionality of the alternator. Price: £10 for the strip of metal & few beers! This was a necessity due to the design of the alternator. I tried locating the standard bracket in different places. But there was either no clearance or the location did not allow the alternator to be fixed correctly. So I put the spacers away, washers away and various nuts & bolts away. I tried to measure out the location required for the alternator as well as the positioning for the bracket in its original location. I had measurements in mind and took my idea over to Will. He listened and tweaked my idea a little. He then cut, welded and sprayed my bracket for me. Will’s mod to the bracket allows me drop the bracket lower down to avoid the case. This in turn allowed the adjustment side of the bracket to move the alternator away from the block, its lucky that the Mustang engine bay has enough room around the engine to allow this mod. Fitting was fine after I drilled the hole where I wanted it to go. I managed to position the alternator adjustment nut at the bottom quarter of the adjustment. Tightened the nuts up job done. (I then made my template for the belt, see the tip above). Purchased the belt, and fitted it. Well happy. I have pointed the bracket out in red and also you can spot that I cable tied the wire to the bracket to keep it in place. It works and does its job by moving the stud away from the block. This is a bespoke build and design, I am also desperate to know how other people get on with this issue of the one wire alternator. American Autowire recommend the one wire so others must have fitted them. Was it just this make that has the issue? The only slight point is that the belt is close to the bracket. Time will tell if I need to revise the design to allow more clearance. I don’t expect I will need to amend the design to be honest. So I am very happy. I will always carry a spare with me anyway. Rating can only be full marks. What did it all cost me? A selection of imported ales from around the world, especially America. Cheers Will. 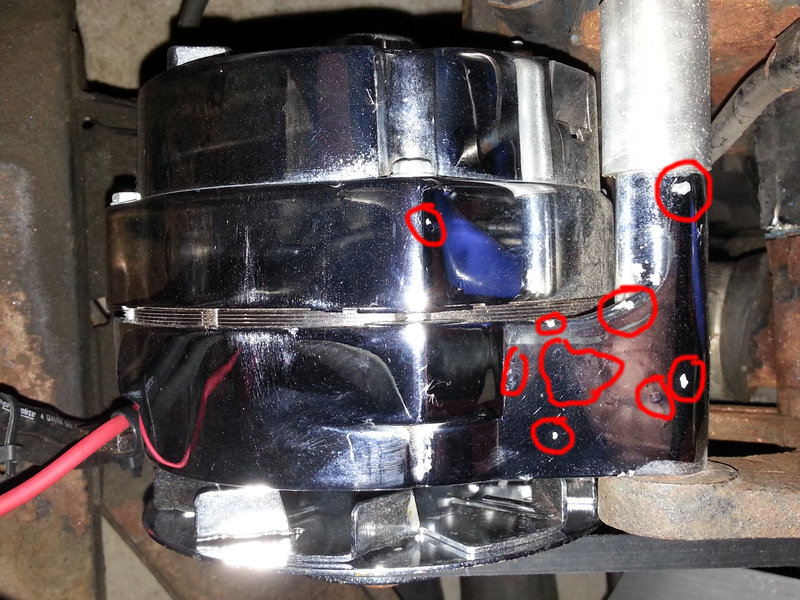 Instead of making a custom bracket, why not relocate the alternator’s positive stud? This is done by ROTATING THE CASE! It’s called “clocking” (indexing). Brilliant, thank you so much for that. Awesome. I couldn’t wait any longer and looked into it. My Alternator is not able to be re-clocked unfortunately as my model is the 7078ND. I will keep looking though. you surely know your onions, congrats! ? !